[UPDATED] Welcome to this roundup of the Best Temperature & Humidity Controllers for growing cannabis. Just like people, weed feels most comfortable when the temperature and humidity levels aren’t too low or too high. It grows best when it’s between 68 and 77 degrees F and between 40 to 70% humidity. Certain growth periods need a more specific range (but we’ll get to that in a minute). If you’re investing your time and money into raising cannabis, you’ll want to control grow room temperature and humidity to get the best harvest possible. When you grow indoors, you’re the boss of the environment. With the right tools, you can keep things in balance. We’ve reviewed a number of different grow room climate control options below. You’ll find simple hygrometers and thermometers; heaters and cooling; humidifiers and dehumidifiers; and full-featured grow room controllers. So, whether you’re on a budget or you’ve got money to invest, read on and you should find just the right grow room control solution for you. The basic tools you need to control the environment in your grow tent or room are a thermometer and hygrometer. You can find good all-in-one hygro-thermometers for a decent price. If you plan to grow in the years to come, buy the best one you can afford. It will save you a lot of stress and probably some money, too. Extech is a trusted name in measuring equipment and this is our favorite tool. 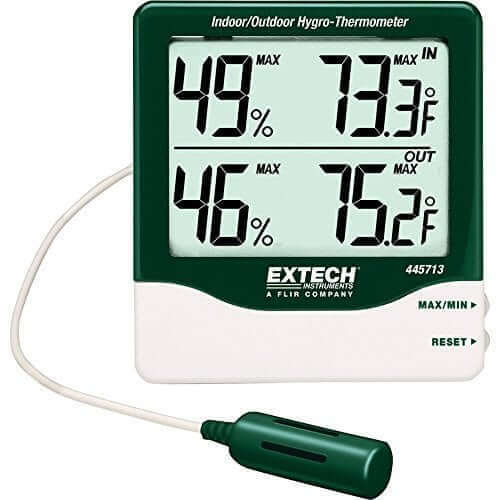 The 445713 hygro-thermometer is a handy all-in-one solution that shows you indoor and outdoor temperature and humidity. It has a max/min function so you can view differences over the period that passed since you last actively measured. It’s accurate down to +/-1.8 degrees F and +/-5% humidity. Hang the 445713 on a nail or stand it up inside or outside your grow tent. Stick the probe into the soil in the shade under your plants. The display is big and clear for easy viewing even in low light. 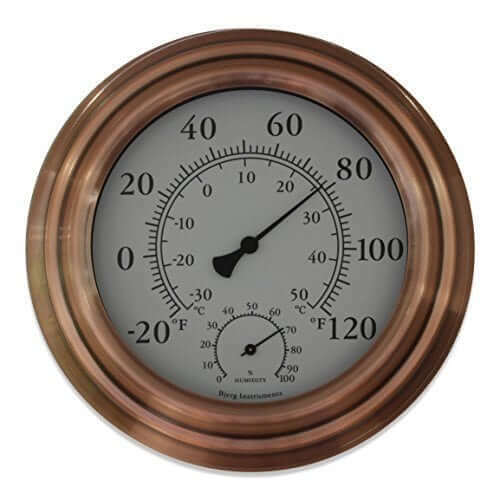 If you’re old school, you may appreciate this simple and elegant wall thermometer from Bjerg Instruments. 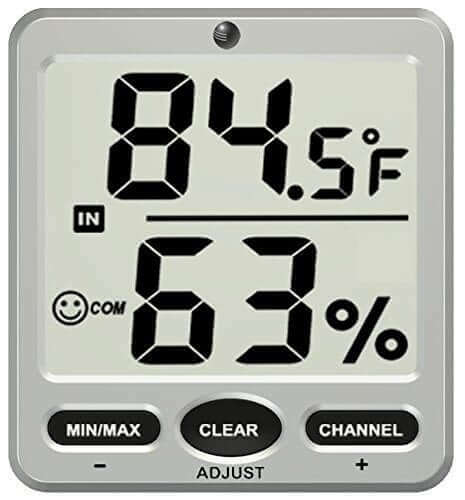 While it only shows you the temperature, you can hang it on the interior wall of your grow tent for a classy look. If you’re only growing a few plants in a closet, this may be all you need. Plus, it’s just half the price of the Extech hygro-thermometer. But then you’ll still need a way to measure the humidity. Those little soil moisture meters won’t cut it. Our last selection is less expensive than the Extech but still a full-fledged hygro-thermometer. The Ambient Weather WS-07 doesn’t have a probe to check the soil but at least it can help you see how the air in your grow tent is doing. Now that we’ve covered some of the basic tools to measure environmental conditions in a grow room, let’s move on to what temperature and humidity levels are best for cannabis. You control the weather in your grow room. You can create the best conditions for your plants. We’ll get to how you can do that. Meanwhile, here are some guidelines. The best temperature range for growing weed is between 68 and 77 degrees F. Also important for healthy cannabis, there shouldn’t be more than an 18-degree difference between daytime and nighttime temps, or lights on/lights off. Like we said, weed’s comfortable where people are comfortable. If it gets too hot, like above 80 degrees, the plant growth may speed up but you’ll need to increase watering and fertilizing. It may stretch instead of focusing on growing big buds. Keep your plants at the high end of the ideal range when they are vegetating, then drop the temperature to the low end for flowering and harvest. With regards to humidity, or moisture in the air, cannabis likes it between 40 and 70%. Certain growth periods like more humidity than others, like sprouting. When you sprout seeds and have seedlings that are beginning to grow roots, give the plants 65 to 70% humidity. Once you have leaves and are in the vegetative stage, gradually lower the humidity each week by about 5% until the plants begin to flower. At flowering, keep humidity levels around 40 to 50%. Then about a week or two before you harvest, lower the humidity more, down to 30 to 40%. Take a good look at your growing area. Is it a closet, a tent, or a room? Is it in a climate-controlled area like a bedroom or in something more exposed to the elements, like a garage? How much ventilation do you have? If you use a grow tent, you probably have a relatively well-sealed off area where you have good control over conditions. You may already have a fan or extractor setup, especially if you’re using hot lights like HPS. HPS, or high-pressure sodium lamps are great for growing weed, except for two things. They consume a lot of electricity and they make a lot of heat. You can hit over 100 F in a small tent with HPS lamps. If this is your setup, be very careful about monitoring the temperature and using the fan and ventilation system to keep things cool. Also, place your ballasts outside the grow tent if you can. If you use LED lights, you’re wasting less power and you’ll have hardly any heat to expel. In fact, if your grow room is in a cold place, like a garage in the winter, you may need a space heater with a thermostat to help you warm it up. Always use a heater in conjunction with a shutoff temperature or you could roast your weed by accident while you’re out shopping. 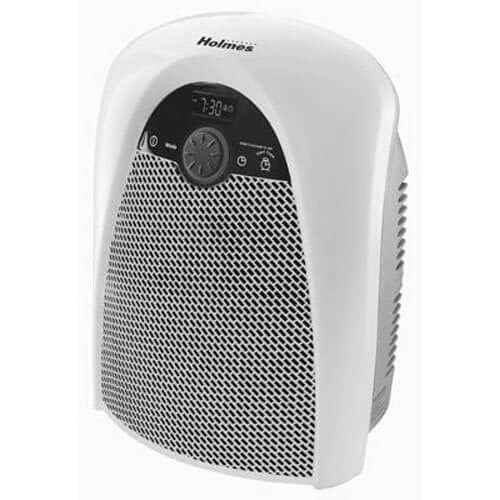 We like this little Holmes heater because it has a built-in thermostat and timer, it hangs on a wall, plus it’s made for the bathroom so it tolerates humidity well. It’s cheap so it only has one setting, which is full blast. Just don’t point it directly at the plants. 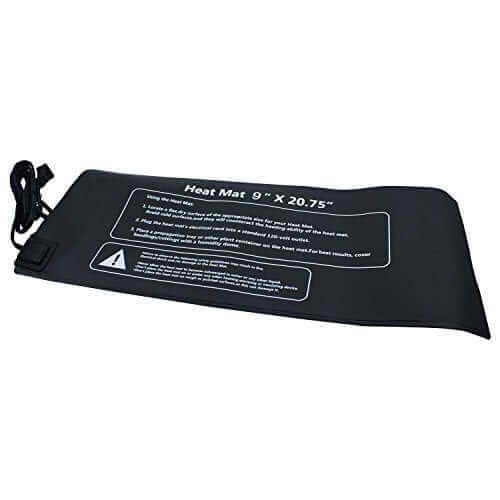 Another way to raise the temperature for your plants is a heating mat. It’s like an electric blanket for your weed. This heating mat from Apollo Horticulture will raise the temperature 10 to 20 degrees F to help your seedlings grow strong roots. It’s waterproof, an essential thing for using with plants. Okay, besides making a grow tent warmer, how can you cool it down? Let’s say you live in a tropical place where “cold weather” means you hit 65 degrees F at night. In that case, we hope you have an air conditioner. If not, get one for your weed. Or at the very least, try one of these solutions. Made to run off ordinary household current, this A/C window unit from Frigidaire cools and dehumidifies air in a room up to 150 square feet in size. You can wash the air filter to keep smells and bacteria under control. Plus, you can direct the air flow so it doesn’t blow directly on your plants. If you don’t have a ventilation system in place and you’re facing high temps in your grow room, try using fans to circulate the air. 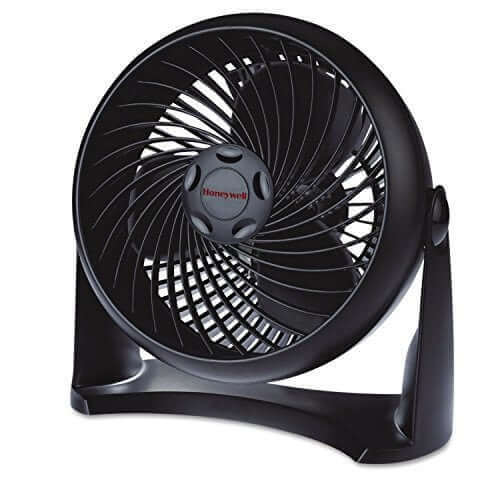 This quiet little fan from Holmes has three speeds and can be hung on a wall. If you happen to live in the desert, raising weed can be a challenge simply because your average daily humidity might be too low. Weed wants around 65% as a seedling, and at least 30% when you’re ready to harvest. This is hard when places like Phoenix and Las Vegas drop down to 20%. Of course, you can spritz your plants with water to help raise moisture levels, at least temporarily. Or you can place an open container or two of water around the tent. This may not be enough either. If you live in a dry place, invest in a humidifier. You can run it on a timer so it can work while you’re playing. Keep in mind that there are two kinds—cool mist and warm mist–and both may influence the temperature in the grow tent. Sometimes we wonder if the folks at Holmes raise marijuana on the side because they make a lot of useful products for growing. 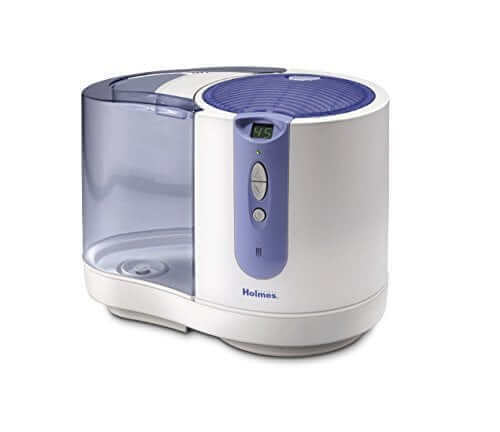 Their Cool Mist Comfort Humidifier runs up to 48 hours on a single tank so you have to fill it fewer times. It has four settings so you don’t drown your plants in moisture. It will shut off when it reaches the desired humidity, and it also has a timer. 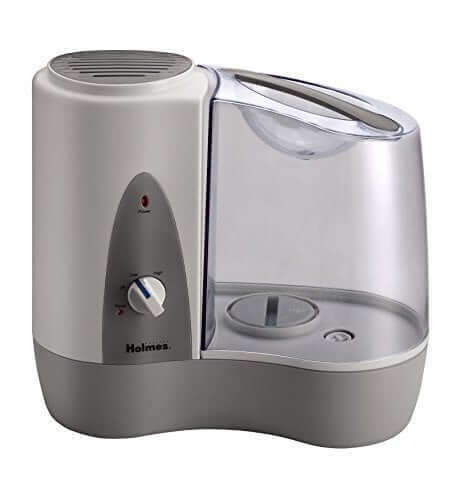 While not as fancy as their Cool Mist Humidifier, the Warm Mist Humidifier from Holmes runs up to 24 hours on a single tank. Let’s imagine that you live in a humid place, maybe that town where those vampires and werewolves and that pasty-faced girl lived. Wait, you didn’t see the movie? That’s cool. Just think of a place where it rains a lot. Growing pot in high humidity means you’ll have to constantly watch for mold and mildew and growth problems. While seedlings like it wet, adult plants thrive around 40% humidity as they near harvest. 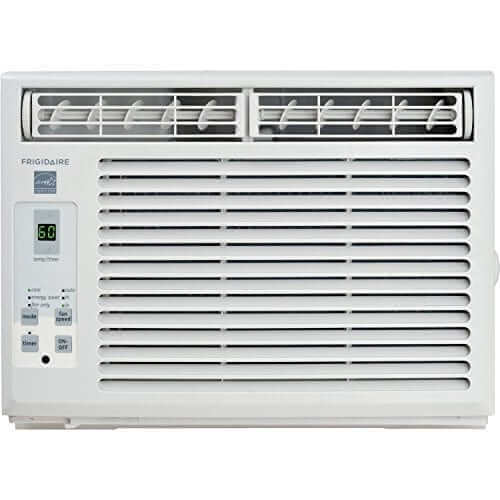 If you want to lower humidity in your grow tent and you live in a hot place, an air conditioner will help you a lot. If you don’t have one, you’ll need to upgrade your ventilation system or invest in a dehumidifier. Just blowing around around with a fan won’t cut it. 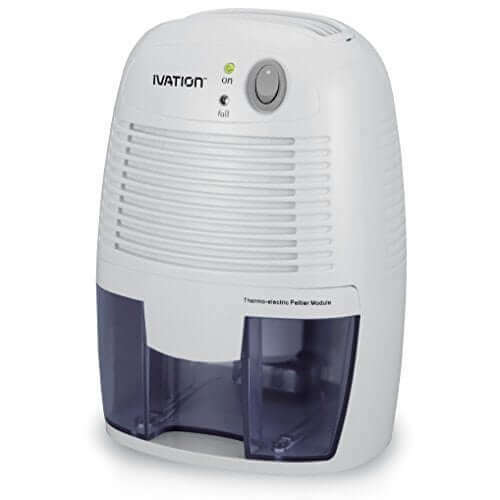 This Ivation Dehumidifier works silently. It takes care of small rooms by condensing water from the air and draining into the transparent cup at the bottom. When the cup is full, it shuts down until you empty it. This is a low-cost solution for a small grow tent. In fact, be sure to monitor humidity levels to make sure this isn’t taking too much out of the air. This beast from Frigidaire can run continuously if you run a hose to a drain. 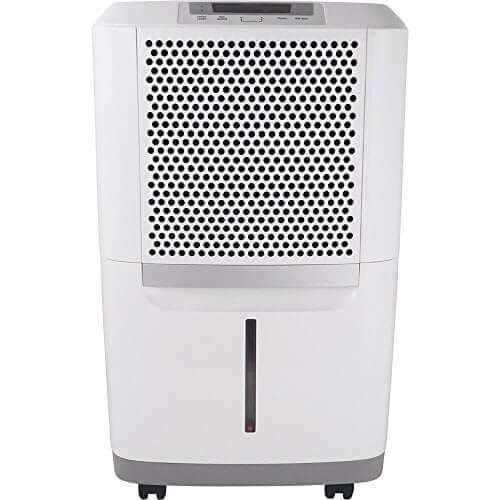 If you have a large grow setup in a damp basement, this is the dehumidifier of your dreams. 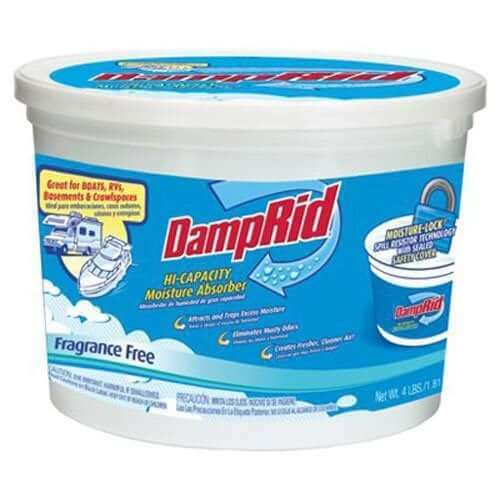 If you have a very small tent, DampRid is probably the cheapest way to control humidity. Again, just keep an eye on your hygro-thermometer. Did you know that CO2 also affects the growth of your cannabis? If you have a large grow operation, you’ll want to invest in monitoring equipment for this factor too. With a small home grow, all you need to worry about is getting fresh air to your plants. A simple fan will mix up the air and help the plants get the CO2 they need. You may be thinking that all this is a lot to manage by yourself. Sure, you can put some things on timers, but it’s still a lot of monitoring and tweaking. Isn’t there an easier way? Of course! Make it easy on yourself. If you have a hydroponic setup, these controllers make grow tent or grow room climate control so much easier. They help with cannabis planted in soil too. You can monitor and control temperatures, humidity, CO2, and even control lights and watering with some of these babies. 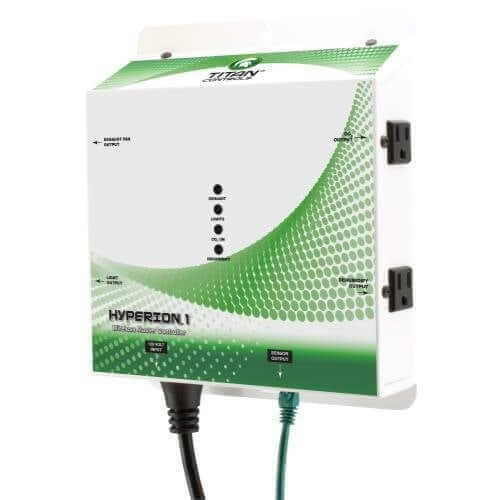 Tital Controls Hyperion 1 is the ultimate controller. You can mount the panel up to 150 feet away from your grow tent and still see what’s going on. It keeps track of temperature, humidity, and CO2 levels. If you add on a lighting controller, you can also take care of your grow lamps. If temps get too high, Hyperion will save the day. If the Hyperion 1 seems a little too much for your small setup, check out this controller below. 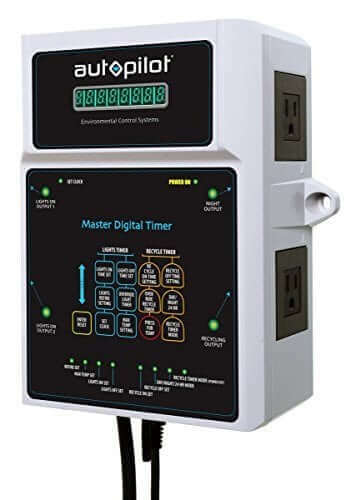 The Autopilot Master Digital Combination Recycling and Lighting Timer is made by hydroponics specialist company Hydrofarm. It can manage your lights as well as a CO2 injection setup. It protects your weed from too-high temps, too. 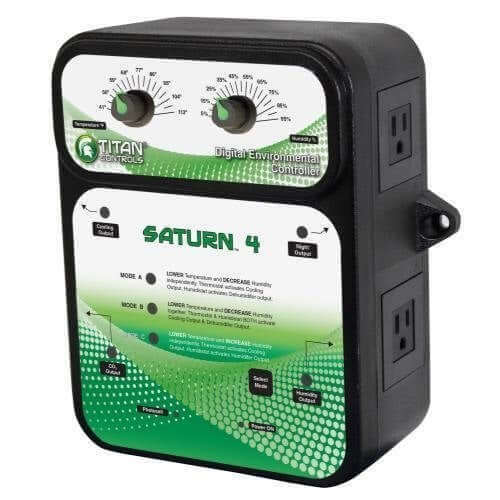 The Saturn 4, also from Titan Controls, is an analog grow room environmental control system that manages a fan, dehumidifier, a CO2 device, and another device that you only want to run at night. (The photocell is what it uses to determine when nighttime is for your plants.) It has a remote sensor on a 15-foot cable so you can plant it in the soil. You’ll need a timer because even rocket scientists forget to turn off the lights sometimes. 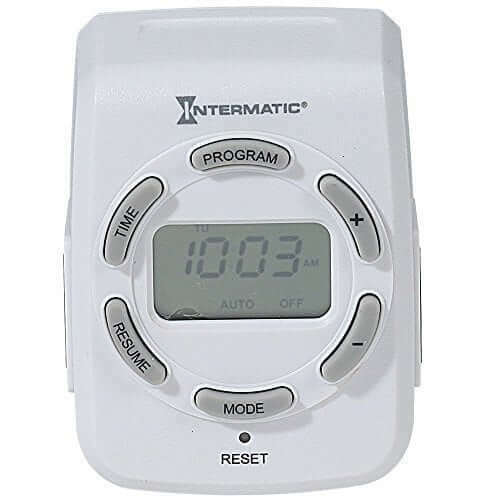 This digital timer from Intermatic has two outlets so you can program different times for two devices, like lights and a fan, or a heater and humidifier. Whether you have one plant or ten, design your grow setup ahead of time for the best results. Buy higher capacity or better quality products than you think you’ll need so you won’t have to replace them soon. Save money by using LED lights instead of HIDs. It’s a bigger initial investment but you won’t spend as much on electricity and you won’t have to replace bulbs for up to ten years down the road. Plus, you won’t have to cool down your grow tent just because of the lights. If you’re in doubt as to how much weed is legal in your area, check out this handy site that keeps track of the laws in various states. It’s always better to know before you grow. Then you can plan the appropriate precautions, like a good ventilation system with an odor-reducing carbon filter. Once your plants have matured, use a bud trimmer to make harvesting easier and faster. 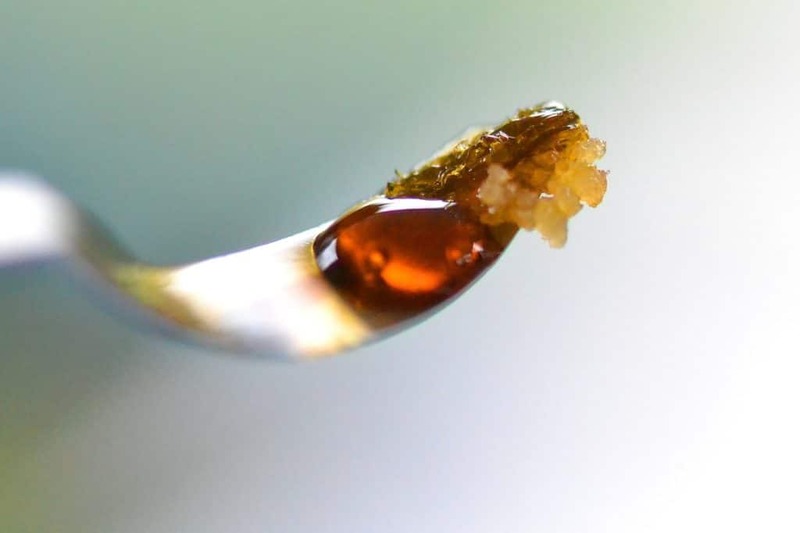 And don’t toss out those leaves because you can use them to make cannabis oil. We hope you enjoyed our guide to the best temperature and humidity controllers for growing cannabis. 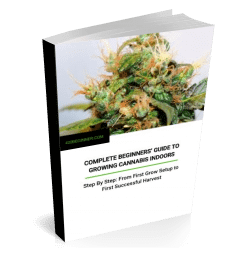 Learn more with our free guide to growing weed. Check back soon for more reviews of the best products to help you harvest the best buds or sign up to our growers’ newsletter. in my so called ” Patch of weed” guess what would be the weed. So when calling my plants “weed” look at the Webster dictionary and see for yourself. I must admit, though, at one point I did wonder a bit about not using the word weed. However… I think the word ‘weed’ actually has some very positive connotations and is to some extent a cheeky provocation, a little bit of tongue in cheek irony. Probably why it was adopted and caught on. There’s a strong note of sarcasm there, against those who genuinely do want to define it as unwanted, without value, without utility, as just a weed. I’m sure you’d agree, no plants are intrinsically weeds, and equally all plants can be a weed when someone wasn’t intending to grow them. The point is, weed or not a weed, who decides? Equally, who decides cannabis is a drug rather than a medicine? Illegal rather than legal? Who decides using it is immoral? Who decides it has no value or utility? Using the word weed positively, non-pejoratively calls those things into question a little, I think. Points out, on some level, that it’s all a matter of context and arbitrary classification. As for positive connotations, what else do we associate with the word weed? Natural, wild, grows free in nature. I.e. not some crazy synthesized artificial substance, just a naturally occurring plant we can choose to cultivate or not. Probably not bad to remind people of that. Kind of makes sense, too, that cannabis users/growers would claim and identify with a term like weed (apparently it’s the most popular term now) that has just a whiff of the outlaw about it. For instance, nothing inherently wrong with cannabis growers/users or cannabis itself. Yet in certain places an arbitrary definition makes them unwanted… without value… in the wrong place… outside the law. Deeming something a weed, deeming someone an outlaw, they can be much the same process. So, um, yeah… you could say we have considered the definition of ‘weed’. (Maybe too much.) So when we use the word, no offense is intended — quite the reverse. And hey, if it’s good enough for High Times, it’s more than good enough for us. PNG-030 Humidity Controller From Plug N Grow!! That would be a tricky combination.